The truly free service marketplace. I used to sell on Fiverr, but they don’t accept my Chinese bank account, therefore I can’t withdraw my rightful compensation. Luckily, on Blocklancer I don’t have to deal with this discrimination. I have been active on most freelancing websites and they all collect an absurd amount of fees unwarranted for what little work they do. I call this theft and luckily Blocklancer is breaking this circle by introducing a fair amount of fees. I don’t want to present my real identity on freelancing websites, because in my country selling certain things can be problematic. On Blocklancer, you can stay completely anonymous contrary to all the other freelancing websites. The Paypal terms and conditions are just absurd. People can just claim their transactions have been unwanted and Paypal will reverse it without second thought. This is too much of a hassle for me and I much prefer the simplicity of Blocklancer’s payment system. I sold social media followers on Fiverr, but apparently this contradicts their rules, because as of recently my account has been banned and now I can’t continue my work. On Blocklancer, I don’t have to deal with all these rules, I can concentrate on my work. I am steaming currently because Freelancer.com has banned my account without telling me their reasons. I am dependent on the income from freelancing! This was the final straw, I am done with Freelancer.com. Blocklancer is much more transparent and reliable. I really like the simplicity of Blocklancer. You don’t have to deal with bank transactions or Paypal, because their payment system is built-in. You can just delve right into the world of freelancing and earn some great money. On all freelancing websites you need some form of identification, e. g. a pass from your country. But those things aren’t everywhere that easy to get in my home country. You don’t need those things on Blocklancer, which is a great decision in my book. Offer your skills and earn Ethereum. Use your Ethereum to pay freelancers for their work. Buy or sell gigs without a bank account. Only pay, if you are satisfied. You do not need a bank account or passport to start freelancing. Use your integrated Ethereum Wallet to store and send Ethereum. You can easily deposit and withdraw Ethereum without any hassle. Blocklancer is the perfect place to earn Ethereum. 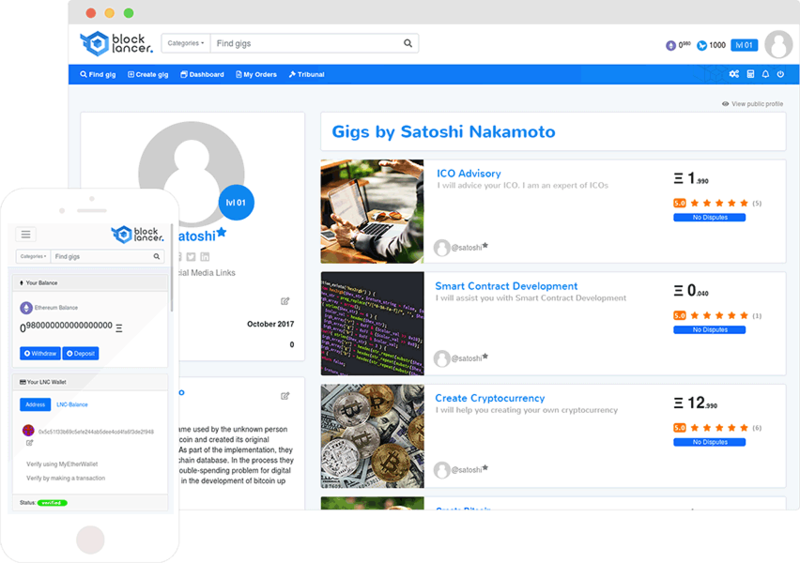 You can earn Ethereum by offering your freelance services. You can start freelancing even if you don't have a bank account or passport. You can upgrade your freelance profile by achieving new levels. Try to become the seller with the highest level. Become an Affiliate Partner and earn Passive Income. The perfect place to find Ethereum & Blockchain jobs.